In Venezuela. from the start of 2017, a carton of 30 eggs has climbed from 3,000 bolivares to 247,500 bolivares. In 2018, the IMF expects prices to climb by 13,000%. That means the prices of a carton of 30 eggs will climb to 32, 175,000 bolivares. 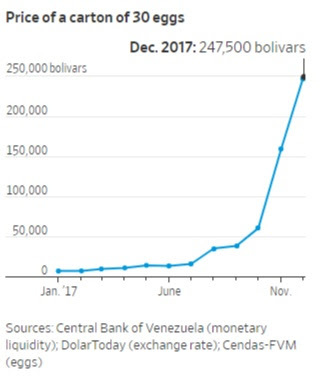 Venezuela has become the 57th recorded case of hyperinflation in history, according to Steve Hanke, a Johns Hopkins University economics professor. The government’s injection of money has fueled the problem. 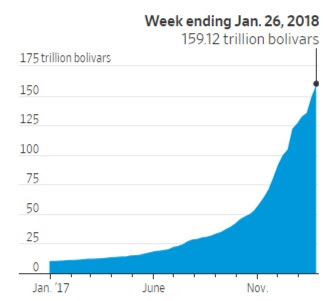 Central-bank data show the bolivar’s supply has risen 14-fold in the past 12 months. Show us the BTC price of eggs in Venezuela. At a transaction cost of ~200 eggs... need I say more? Doubt if they have any working phones or computers left there. They sure seem to from the articles I read. Lots of talk about bank transfers. Via dialup modems or internet or cell phone internet connections. It should be understood that these reported prices are black market prices. Venezuela is a Marxist state where the value of goods is set by state decree. Oficially, inflation in Venezuela is zero and prices have not changed. The fact that you cannot buy eggs from anywhere at the official price is irrelevant.